It’s especially big news for Michigan K-12 educators because the SAT Essay—optional, according to The College Board—now looms large as a requirement in Michigan’s English-Language Arts assessment plans. This change in ELA assessment plans came over the summer as the Michigan Statewide Writing Research Project drew to close. In that project for the past three years, Jeff Grabill, chair of Department of Writing, Rhetoric, & American Cultures at Michigan State University and co-inventor of Eli Review, worked to help teachers integrate feedback and revision in their classes and conduct classroom-based research. To continue that work beyond the grant and respond directly to Michigan’s new assessment plans, Melissa Meeks, Eli’s Director of Professional Development, and Michael Schanhals, an ELA teacher at North Muskegon High School who also wrote our ACT curriculum, developed a free SAT Essay curriculum that emphasizes analytical reading and writing using formative feedback aligned to selected portions of the SAT Essay rubric. We hope teachers in Michigan and elsewhere find it helpful. Feedback and revision are the most powerful components of writing pedagogy, and the best learning environments provide the most opportunities for feedback and revision. Teaching revision helps students align their efforts with criteria and make better decisions about how to respond to reviewers’ feedback. Evidence-based teaching makes visible students’ strengths and struggles so that teachers can intervene in timely, strategic ways. 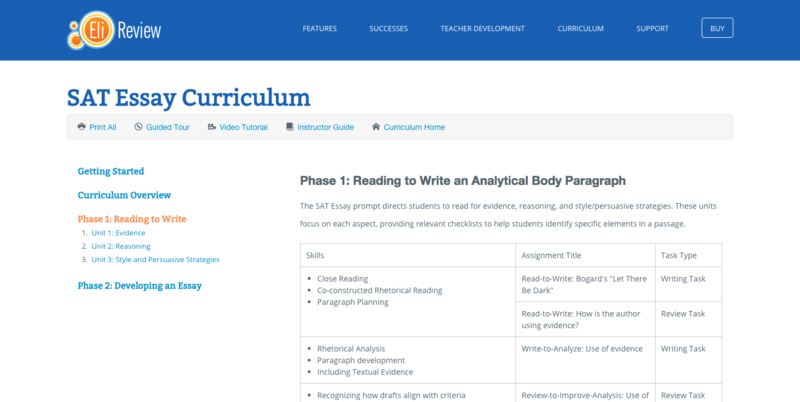 The SAT Essay curriculum includes writing tasks, peer-feedback activities, and revision tasks that focus on close-reading, analytical writing, and five-paragraph structure. Our curriculum scaffolds how students analyze the three aspects required in new SAT Essay: evidence, use of reasoning, and stylistic/persuasive strategies. We guide students to combine their analyses of the three aspects into well-formed essays. Instructors can customize this curriculum to meet their needs. The tasks can be used with any reading passage. Instructors can decide how many times a review is used, how much of a pre-built review is used, and what order the units are taught. We designed the curriculum to help teachers use their expertise about learning and their insights about students’ needs to teach skills and habits from the Framework for Success in Postsecondary Writing while also preparing students for a high-stakes writing test. In Read-to-Write reviews (3), students can see how their partner’s choices compared to the whole class and how they and their partner marked-up the passage. By working together, they can construct a strong interpretation of the passage and a better analysis. In Review-to-Improve Analysis reviews (9), reviewers identify the required elements in analytical body paragraphs and give feedback to writers using some of the criteria included in the SAT rubric. Instructors and students see trends that help them know how well writers and reviewers are doing. In Revision Plans (5), students select their best feedback and reflect on how they’ll use it to revise their work. Revision plans encourage students to use metacognition to be aware of the choices they are making as writers—choices they’ll need to make quickly in a timed testing environment. Eli’s other advantage is its efficiency. Because Eli does the heavy-lifting in coordinating draft exchange and making learning visible, teachers can coordinate and coach a lot of practice. By practicing with these tasks, students can become proficient at close reading, analytical writing, and five-paragraph structure. After students practice until they are proficient, it’s easy to help them practice until they are fast. If you’d like to learn more about using or customizing the SAT Essay curriculum in Eli Review, contact [email protected]. A Formative Curriculum for the 2016 SAT Essay was published to the Eli Review Blog in the category Uncategorized.